Music has always been a huge part of Pete’s life. His earliest memory is sitting under a table, listening to his dad’s choir of navy sailors singing “Dem Bones.” Dad’s record collection educated him in music, from Broadway musicals to Miles Davis, from Joan Baez to Leadbelly. Living near Washington, DC enabled Pete to experience all sorts of live performances, from Odetta to Stan Getz to The Beach Boys, Stones, and Animals. He grew up during the folk music boom and the “British Invasion,” embracing “the Blues.” He was captivated by the explosion of music during the Sixties, particularly Jimi Hendrix, Janis, Canned Heat, Paul Butterfield, the Youngbloods, Steppenwolf, Chicago, and Santana, all artists he was fortunate to see live. After several years in school choirs and musicals, he began a lifelong attempt to play and perform on guitar, bass, piano, synthesizer, drums, and harmonica. Musician by default, Pete says. Pete says he doesn’t know where his infatuation with FUNK came from. He just knows that something clicked the first time he heard James Brown singing “Papa’s Got A Brand New Bag.” Fifty years later, he still finds joy in sharing the FUNK, both old school nuggets and fresh new cuts. When not volunteering at KRVM, Pete is enjoying retirement (from a 25 year teaching career) with wife Cindy. He is puttering around in his garage/music studio, playing with his grand kids and planning some road trips and cruises. Pete loves Oregon in general and Eugene in particular. 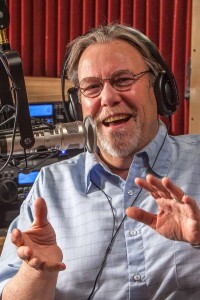 He thinks KRVM is the “greatest station in the universe,” and – with a wink – dares you to prove him wrong.